Apple is one of the the best first food for your baby. Babies get easily accustomed to tastes that are introduced below 1 year. Try to feed all types of fruits and veggies below 1 year, so that you will have no tough time in future. As your baby grows, I wish you don’t want to run behind your kid, reciting the adage “An apple a day, keeps the doctor away” . Nilaa’s playschool kids’ parents keep complaining that their children don’t wish to see fruits in their snackbox. When I had a short questionnaire with them, everyone admitted that they have not built the habit of having at the least 1 fruit a day(recommended is 5 including veggies) ! So, when the kids are introduced to fruits just in sake junk is not allowed in the school snackbox, you will have a tough time there! Apple is a very good laxative and supports digesting the first foods introduced to the tiny digestive system. It helps in passing smooth stool. By the way, Apple keeps constipation at bay 😉 Lets take a look into the recipe..
1. Cut a piece of apple, peel the skin and further cut into small pieces as shown below. 2. In a vessel(I have used BoroSilicate glass vessel), add apple pieces and pour water till immersing level. Let it boil in medium flame until water is vaporized and apple is cooked. 3. 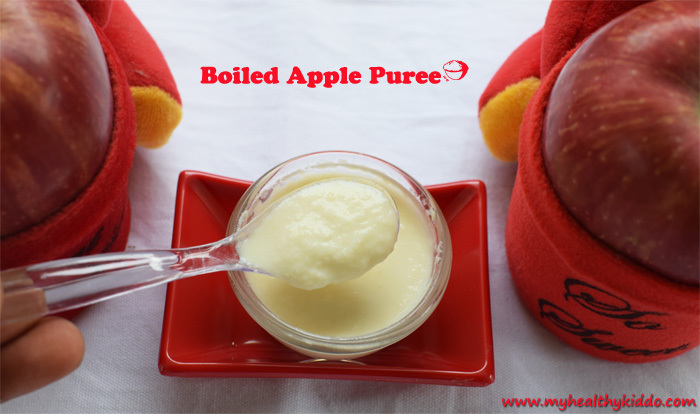 Blend the cooked apple in mixie along with few drops of apple cooked water, if there is any leftover in the vessel. Add mother’s milk/formula and blend it again to a smooth texture. Feed this immediately to baby. No need to add sweetener. Baby will love this as it has an additional topping of mother’s milk/formula that the baby is fond of. You do not require pumping machine to collect mother’s milk. Just squeeze out the milk using your fingers to a clean bowl. Do not panic that squeezing out milk might lead to insufficiency during next feed! Not at all ! As I have repeatedly mentioned, when the demand(suckling/pumping/squeezing) is more, the supply(milk secretion) will be more 🙂 Refer to my article for Lactation diet & tips. 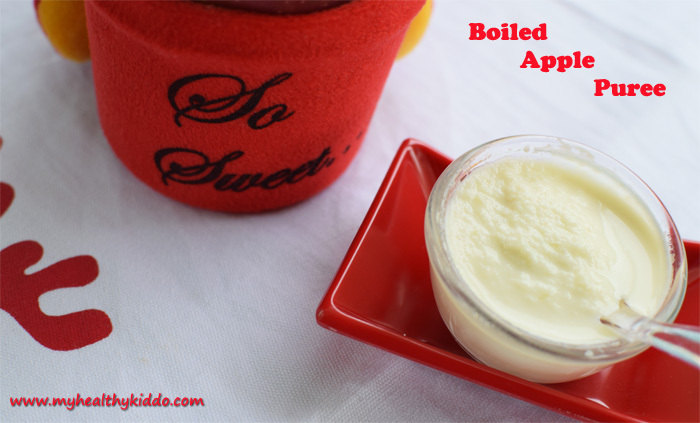 If you want to start apple to your baby, first start with apple water(Click here for recipe). 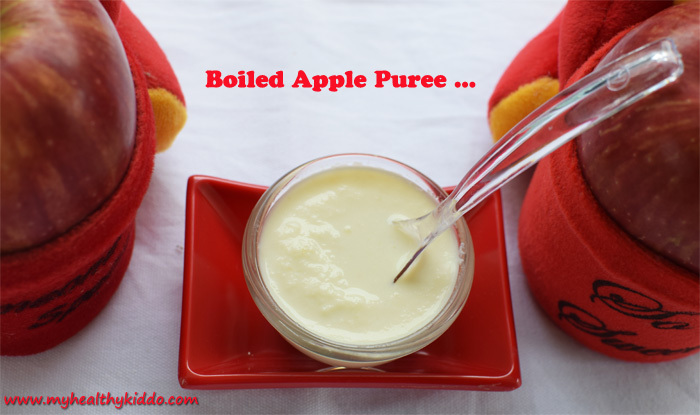 Then gradually move to boiled apple puree as per this post. Then, in just a month, you shall start raw apple puree(just omit boiling and follow the other instructions as per this post). Mother’s Milk – Unmeasurable nutrition !